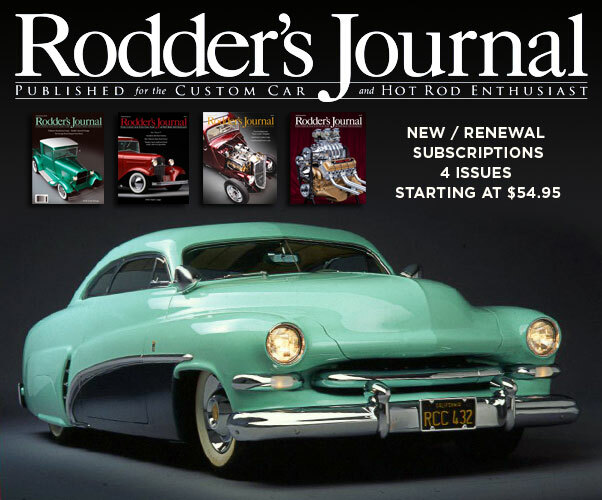 Tags: '36 Ford, 1936 Ford Coupe, Alex Xydias, Bob Fairman, Don Kretzer, fade away fenders, Fadeaway fenders, Jamco, Jimmy Summers, Joe Johnson, Rodders Journal ad, Smith Car Co.
Around 1941 Jimmy Summers and Bob Fairman create this full Custom 1936 Ford Coupe with fade away fenders. A trend setting Custom Car Icon. 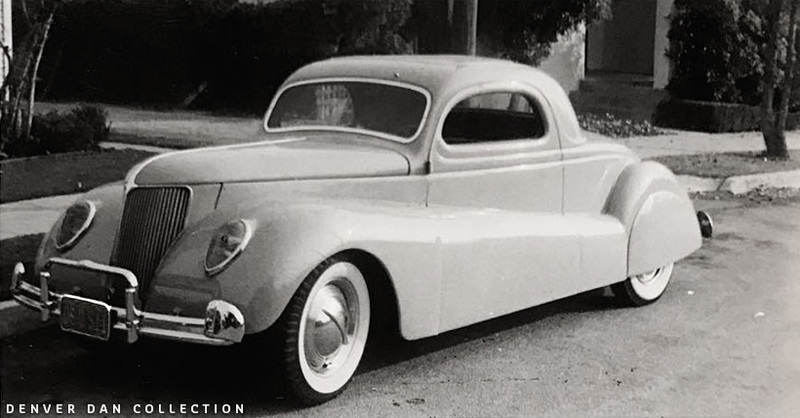 The first time I saw a picture of this wild looking ’36 Ford chopped Coupe with full fade-away fenders was in the Hot Rod Memory book published by Don Montgomery in 1991. The photo he shared was from the Mel Paisley collection. The photo caption did not provide much information, it did not mention the builder, or the owner. Id did mention that that particular photo was taken in 1945, so I already knew the car was an very early full custom job. Later I came across one or two more published photos in the Dan Post books that I had bought from online auctions. A friend of mine in the US mentioned that the car was built by Jimmy Summers. Which made sense because of the very early fade-away fenders. But no other info was found at the time. More information about the car was gathered when Carlos started a thread named ANY OLD CALIFORNIA GUYS KNOW THIS CAR ? on the HAMB on May 12, 2009. 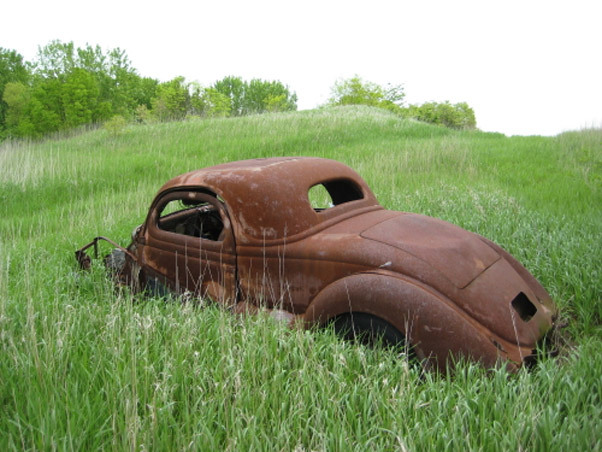 Carlos had taken a series of photos of an very rusted chopped top ’36 Ford coupe with full fade away fenders in a field in Ohio. At the time my Custom Car Photo Archive already had all the photos I had found on the car listed under the Jimmy Summers section. So it was not long before the link to the Jimmy Summers section was added to the HAMB thread. Carlos happened to be a friend of the guy who stored the car for the then owner of the car. The car was not supposed to be stored outside, but it was, and it it destroyed much of the car. 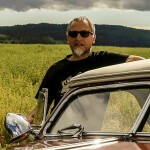 Carlos posted the photos to try to find out more about the history of the car. 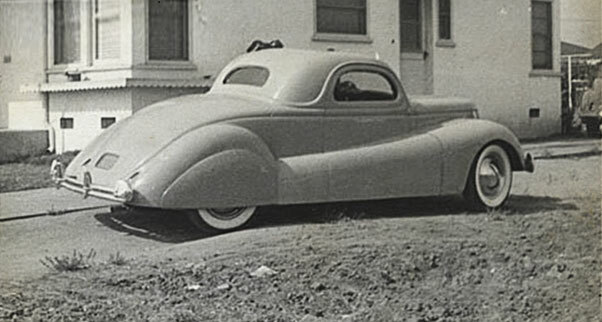 At the time it was known that the car came from California, the name Summer had been mentioned as the builder, but he had no other information, nor old photos of it. When I found the thread on the HAMB I really could not believe that A, the car had survived and B somebody who made sure the car had survived would leave it sit outside rusting in a field. But I was thrilled and hoped somebody would be able to buy the remains and get it completely restored. 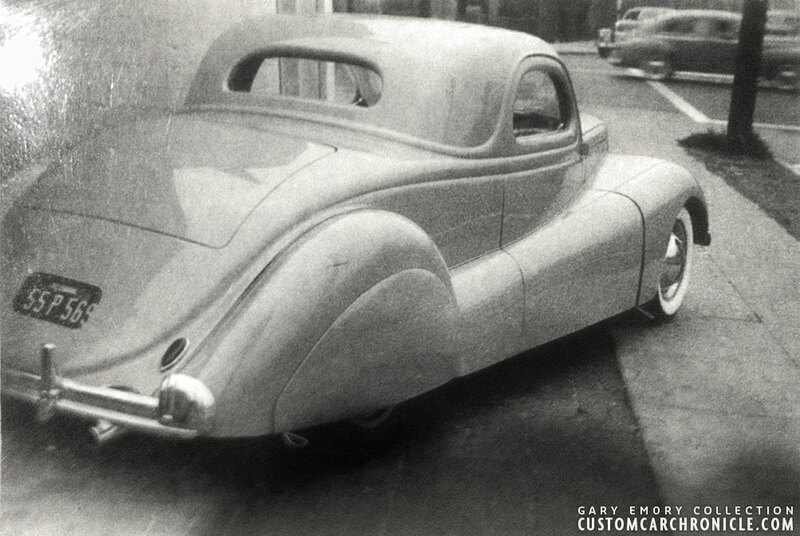 This was an very early full Custom Car, created by Jimmy Summers, Custom Car pioneer. And not much of his work is still with us, so this car really needed to be saved. I was able to get in touch with Eddie Montgomery who lived close to where the car was located, and he knew the owner of the car and was able to tell me more about how the car got in the field in such bad shape, and also how this California built Custom ended up in this field in Ohio. 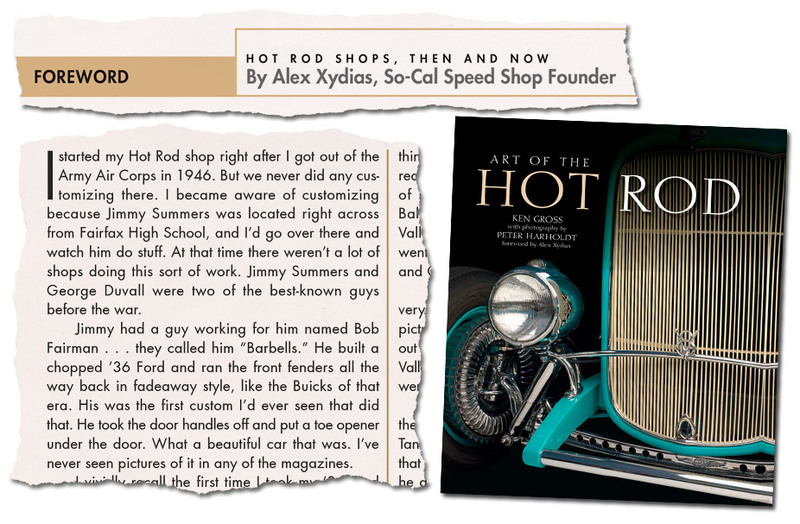 On this thread it was also mentioned that in the Art of Hot Rod book by Ken Gross, the foreword written by Alex Xydias mentioned the car and the owner. 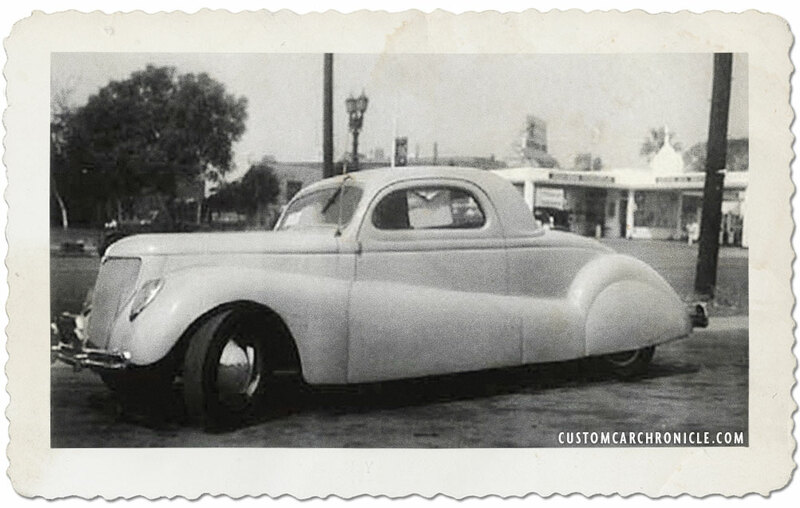 The owner of the ’36 Ford was, according to Alex Xydias, Bob Fairman aka “Barbells” a guy who worked for Jimmy Summers at his Melrose Ave., Ca. shop in the early 1940’s. The foreword mentioned the year 1946, but I later found out that the car was actually built several years before that. It was really great to have a name with the car now. 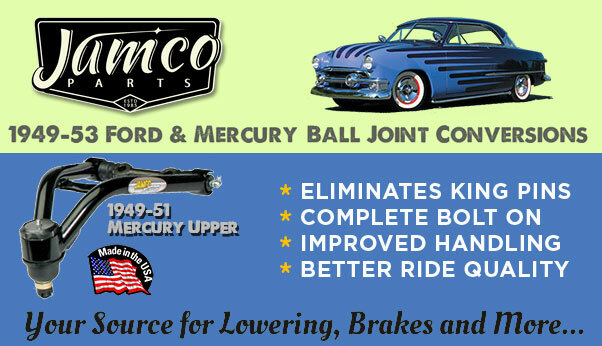 Alex Xydias, founder of the So-Cal Speed Shop, remembered the name of the guy working with Jimmy Summers in the early 1940’s who owned the ’36 Ford with full fade-away fenders. Bob Fairman aka “Barbells”. Over the years I have collected very photo I was able to find of the Bob Fairman 1936 Ford, and fortunately more and more show up. It really is amazing that so many photos have been taken of this car, yet so little is known about it. There also never was a proper magazine feature on the car. Most likely because the car was done so early, and the magazines to feature it did not come out 7 or so year after it had been finished. 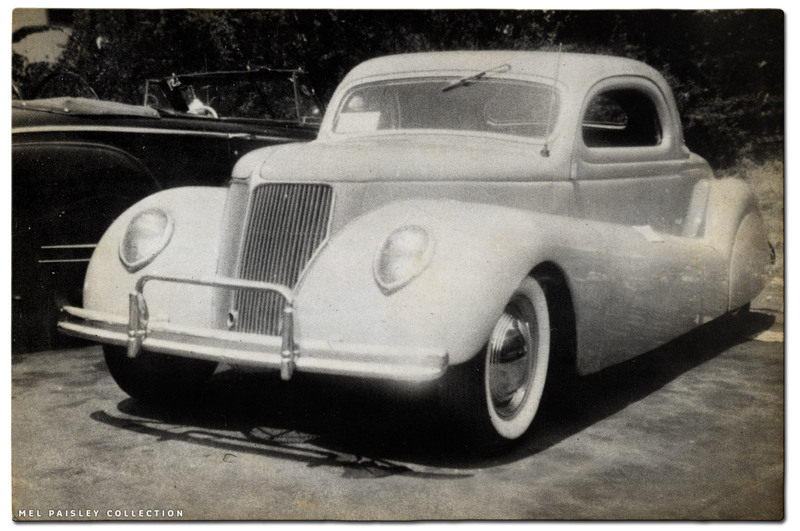 Published photo appears to have a 1941 License plate, and is the oldest known photo of the Bob Fairman ’36 Ford. Not only are the full fade away fenders very unusual for 1941, so are the shaved door handles. Most custom cars still had door handles around this time. The body of the car was channeled over the frame to get it low, the running boards were removed. The grille was sectioned and due to the channeling of the body the fenders are now higher mounted on the body. The top was chopped and now has really nice proportions and flows really nice. The canvas roof panel was filled in with a shaped metal section. 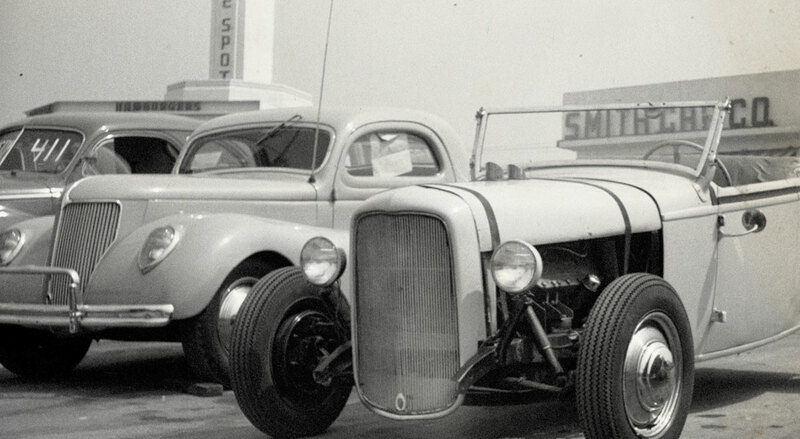 The front fenders were reshaped completely, it is unsure if Jimmy Summers used the stock ’36 Ford front fenders, or perhaps a bit newer 39 Ford fenders, or perhaps completely hand made the units. Jimmy created the full fade away panels before there were any production cars that had these. 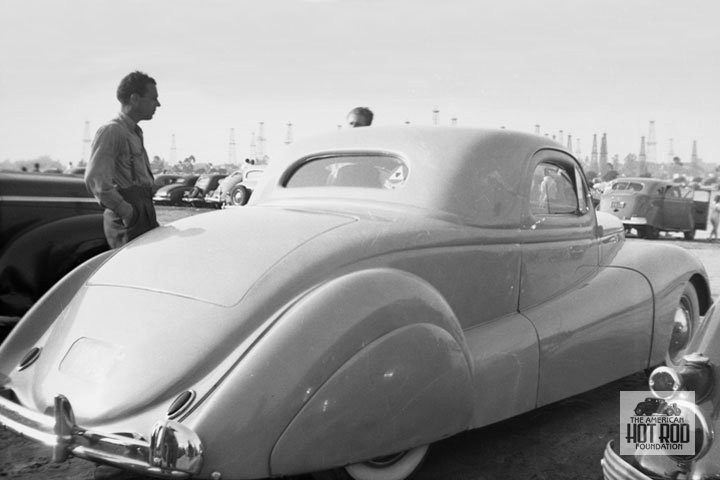 (The first factory created full fade away fenders were on the 1942 Buick’s). The panels had to be completely hand made. Not sure if Jimmy did the shaping on these, or if perhaps California Metal Shaping, or a similar company pre-shaped these panels based on Jimmy’s instructions. All four fenders were not – like we are so used to from other customs from the later part of the 1940’s – molded to the body, instead they are still bolt ons, which require some nice fitting, especially of the rear fenders. The full fade away panels on the doors and quarter panels are also bolt on units. The license plate on Bob Fairman had the 06 Q 511 number which was given to the car in 1941. (1940 plates were yellow with black letters) This photo shows how a pressed metal 1941 top has been added over the 1941 Plate. 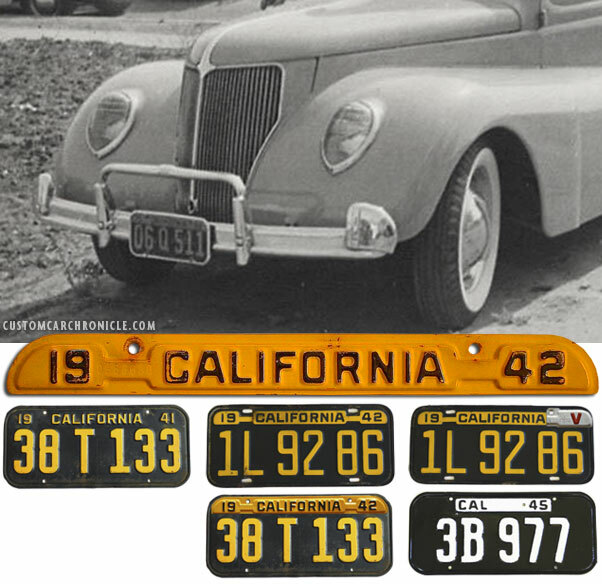 California license plated had aluminum stamped corners with a red “V” in 1943 and 1944. By 1945 the plates changed completely again. Now black with white numbers, and Cal 45 in a narrow white box on the top. Jimmy hand made new hood sides to fit the lower hood and the fade away fenders. The headlight were replaced with fender mounted ’37-38 Ford units. At the rear a set of ’38-39 Ford teardrop taillights were added to the body, next to the fenders. Rather unusual for the time, Jimmy removed all door handles on the car and created foot controlled buttons underneath the fender. Could this possibly the first installment of push button doors? The stock ’36 Ford bumpers were replaced by bolder 1941 Ford units with bumper guards, over rider and accessory corner pieces. Not sure if the suspension was modified in any way. The car sits, just like most of the Custom Cars built in the early 1940’s rather high. Jimmy installed wide white wall tires and added small diameter single bar flipper hubcaps with beauty rings. The very early single bar flipper hubcaps had a much smaller smooth section than the later units that became more popular. A set of teardrop shaped fender skirts was mounted on the rear fenders. This and the next photo have just recently been shared by Denver Dan. it is always great if some new photos of this early custom showing up. especially if they show the car really good as these do. In this photo we can see that the it was taken when the car had the 1942 plates on it. Both photos show that the single bar flipper hubcaps that were used are a lot smaller in diameter of the plain section that those we know best from the mid 40’s and up. These photos also show that the car was painted a light color, but that the white wall tires are a lot whiter. It really makes me wonder about the hue of the paint on the car. The car was painted in a light color, sometimes it is referred to as white, but I think it was not white, but rather light shade of a color. The difference between the body color and the white wall tires is to big for the paint to be white. Eddie Montgomery remembers that the car was a dove gray when he first saw it. And that it was later painted a bronze maroon metallic. 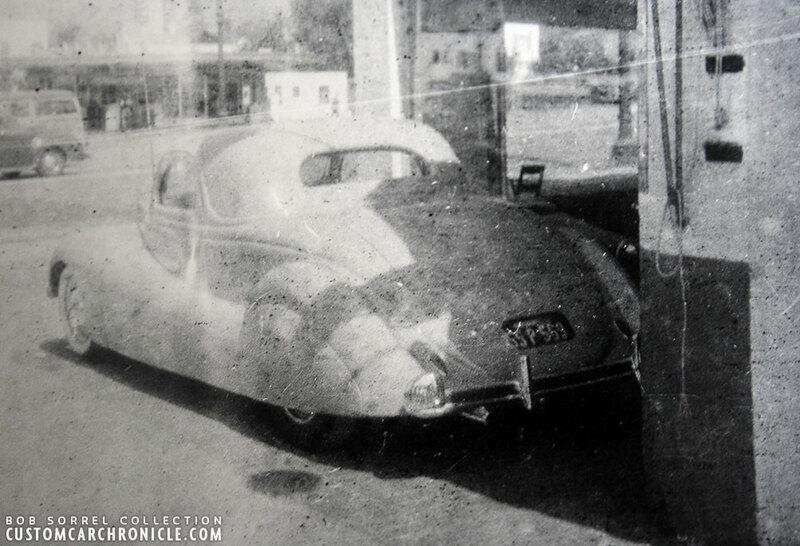 The oldest photo I have been able to locate of the car shows it with 1941 License plates on it. 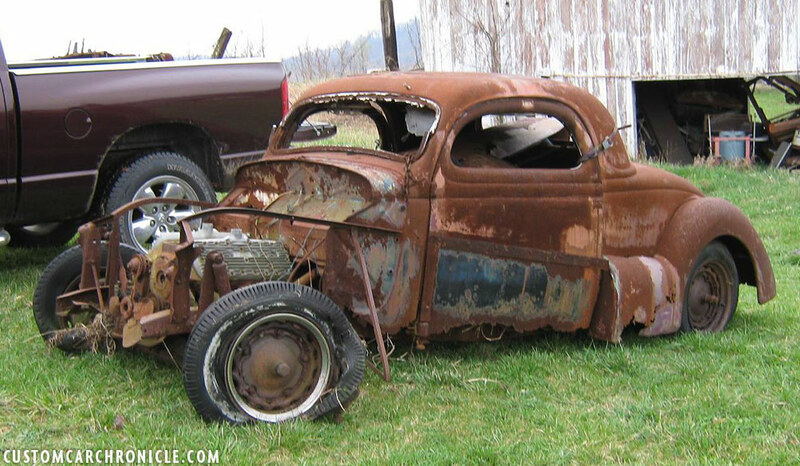 So far I have not been able to find out when the car was built, but since the car is using 1941 Ford bumpers – which look to be the newest parts on the car – the car was most likely built in late 1940 or early 1941. From the National Hot Rod Foundation Collection comes this photo taken at a parking lot, possibly for some sort of event. We do not know when this photo was taken. This photo is the only one I have seen that shows the car with a vent window installed, and judging the reflection, with the door window in the op position. Notice the super straight reflection. Bad scan of a bit fuzzy photo shows the car at possibly another shop. 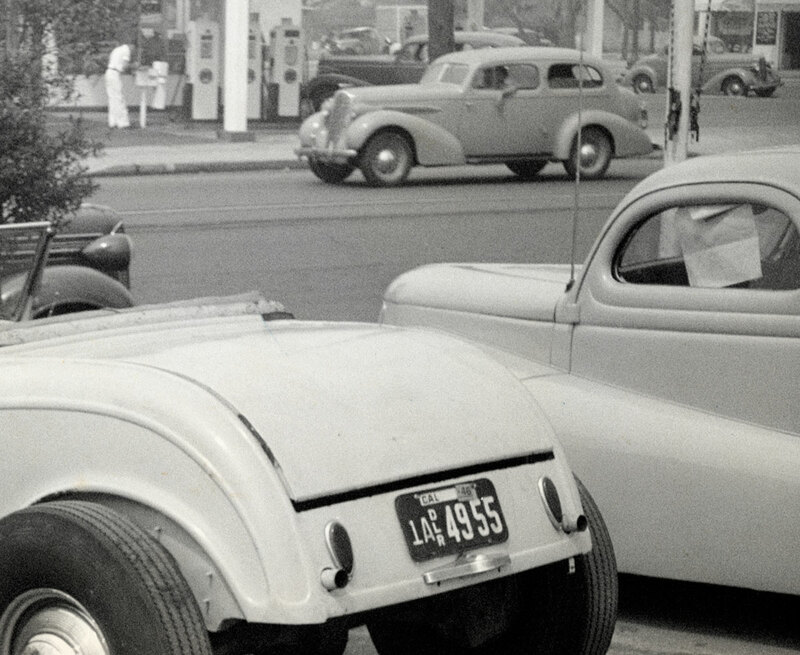 The photo comes from the Bob Sorrel Collection and it looks like a ’46 license plate tag is used on the ’45 plate. This was actually the first photo I ever saw of the Bob Fairman Jimmy Summers built 1936 Ford. Mel Paisley mentioned in the Don Montgomery books that the photo was taken in 1945. By now the rear white wall tire has been replaced by a black wall unit. An cowl mounted antenna was added, and the bumper end accessory pieces are removed. Judging the photos it appears that the car was on a For Sale car lot around 1945-46. One unidentified lot that we can only see a partial lot name “Al H…” with other sings showing “Cash for Cars“. Two other photos (taken by Strother MacMinn) show the car at the Smith Car Co. Hot Rod and Custom Cars for sale lot next to The Spot restaurant in 1946. We do not know what happened to the car after it had been photographed on these Car Lots…. but we do know that the car was bought in the early 1950’s and was driven to Ohio by the new owner. Gary Emory shared this photo of the Fairman Ford with us. It shows the car parked what looks to be a car dealer or so. The plates are ’45 units with possibly a 46 tag. Notice the Curb-feelers mounted on the rear fender, just below the end of the fender skirt and at the front fender in front of the door. The photo gives us a nice look at the set in license plate, with glass cover. Two more photos from the Gary Emory Collection. These photos appear to have been taken at the same place. It looks like a second hand car dealer “Al H…” Cash for Cars. Perhaps the car was parked in front of the dealer building to attract customers. These screen shots come from an eBay offering from some time ago. Then due to the rubber shortage during and after WWII the car now had all black wall tires mounted, front and rear. The first time Bob’s ’36 Ford was used in a publication, as far as I know, was in two Dan Post publications, both published in 1947. The California Custom Car Photo album on the left, and the Master Custom-Restyling Manual on the right. Two different photos were used, one with white walls, the other with black walls and the cowl mounted antenna. 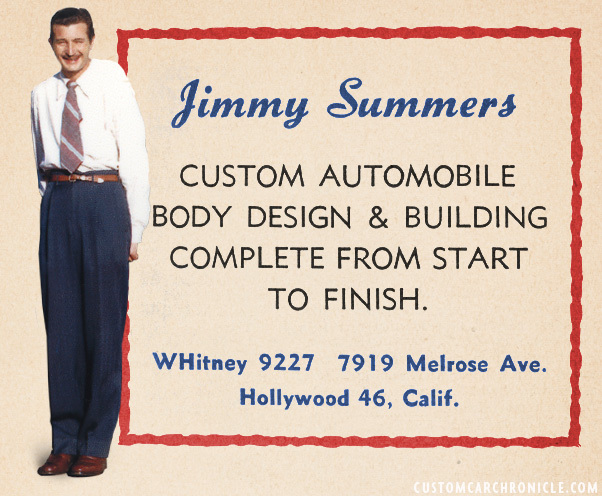 Jimmy summer photographed in 1946 and one of his ads from an 1948 Hot Rod magazine. Thanks to Eddie Montgomery and Don Kretzer we do know a bit more about the car and what happened to it from the early 1950’s until now. In the early 1950’s somewhere between 1951 and 53, (several different stories tell different years for this event) a Ohio based young guy named Joe Johnson got back from serving the marine or Army during the Korean War. 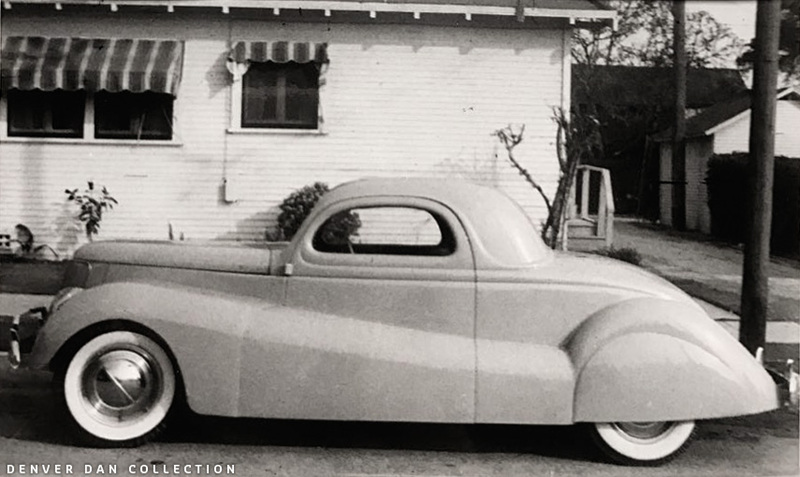 He was discharged in California and before he returned home to Ohio, he found this chopped and fade-away fendered 1936 Ford Custom on a used car lot in Los Angeles. The story does not tell which car lot he found the car at. When Joe found the car was already painted bronze / maroon metallic. 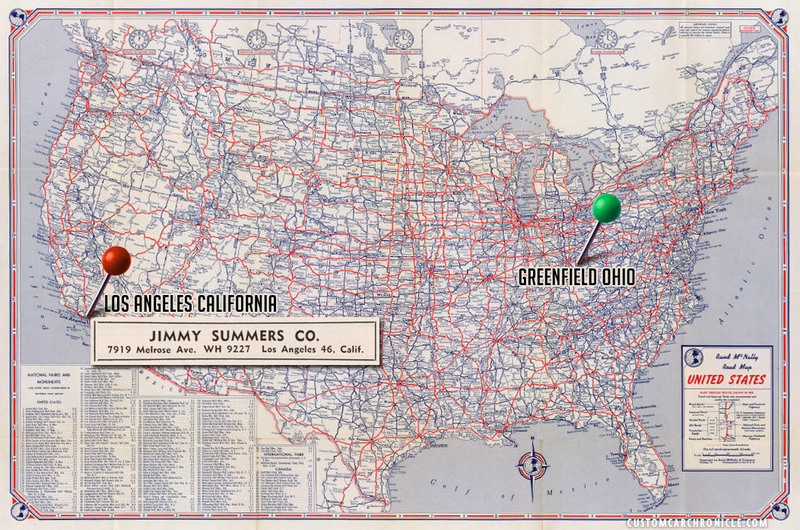 Joe bought the car and drove it across the country to his hometown of Sparguarsville (sp), Ohio. Joe then he used the car as his daily driver for a few years. During this time the car was usually parked in front of Joe’s home, and it was there where a very young Don Kretzer saw the car, and fell in love with it. John Eddington from Greenfield bought the car from Joe and not long after that the engine blew. John fixed the engine and used it up to 1957. By then the car was primer gray, but it is unsure if Joe or John primered the car. John parked the car at his house, first inside, later outside. Sadly we have not been able to find any photos of the car when it was painted metallic Bronze. After the car had been stored inside for some time it was moved outside and left unprotected to the elements – 2009. 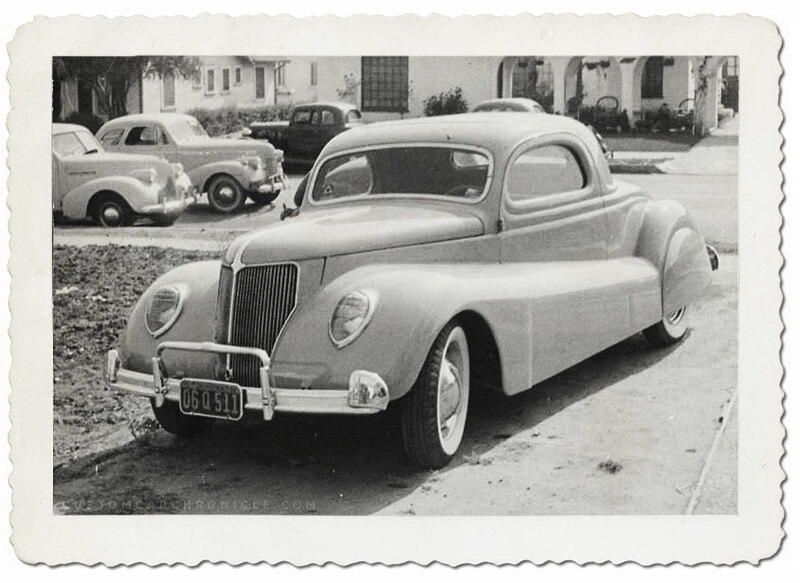 In 1972 the owner of the car took the ’36 Ford to a local body shop for an estimate on a total repair. They said it could not be done and laughed at him. The owner then decided to take the car to the crusher, but Don Kretzer was able to talk him out of that and offered to store the car at his place. The car sat inside his barn for many years, until the roof collapsed and the car was moved outside again where it was left in the elements and the condition of the car quickly became worse. During this time the front fenders, hood and grille were stolen of the car, the current wear about of those parts are unknown. Most likely lost for ever. In May 2009 Carlos, a friend of Don posted the photos on the HAMB, trying to find out more information. 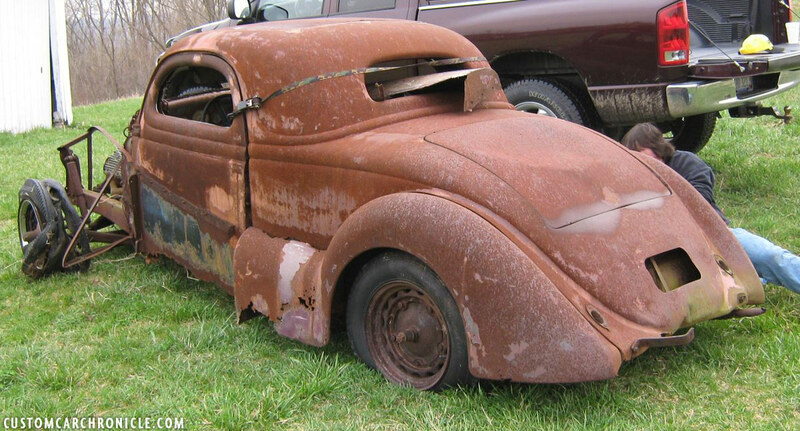 Many phone calls were made from people all around the US to try and buy the remains of the Jimmy Summers ’36 Ford, but the eccentric owner of the car had no interest in selling. Some time later the owner of the car was in a bad car crash and the control of his estate was left to his family. In 2010 the car became available and was sold to Steve. On April 3, 2010 Eddie Montgomery helped Steve in recovering the car from the field it had been stored in for many years. The plan was to get the car fully restored. 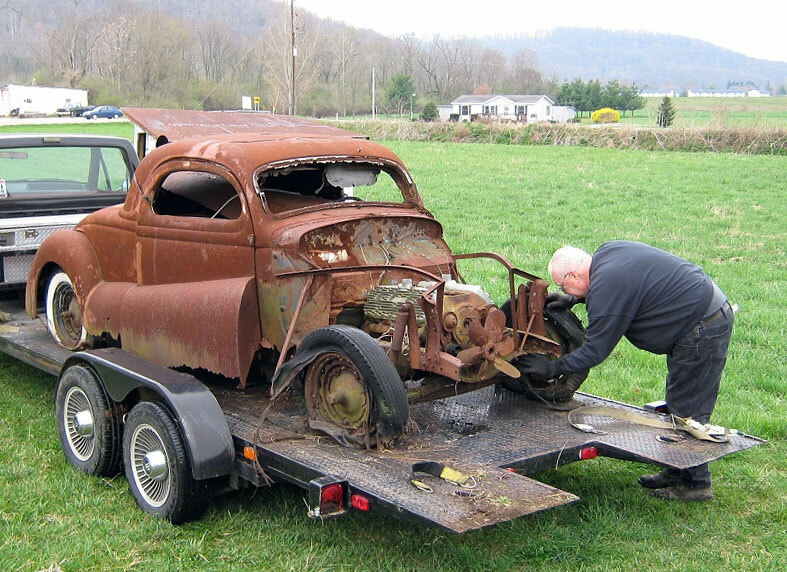 In April 2010, after the owner of the car had a major car accident the car is finally sold and is here being prepared to be pulled out of the field to be stored in better conditions. The drivers side door fade away section is stored inside the car, and sticking out of the rear window. The car on the truck ready to be taken home to the new owner in 2010. The plan is to do a full restoration on the car and bring it back how it was originally built in the early 1940’s. Parts are collected and some of the work is started. Timeframe on the Bob Fairman Jimmy Summers 36 Ford. 1941 (approx.) Created by Jimmy Summers and Bob Fairman at the Summers Melrose Ave. shop in Los Angeles Ca. 1945 (approx.) The rear white wall tires are replaced by black wall tires. 1945-46 (approx.) The car is For Sale on at least two car lots. 1946 (approx.) Addition of the cowl mounted antenna and removal of the Accessory bumper ends. 1951-53 (approx.) Joe Johnson from Sparguarsville (sp), Ohio buys the car from an Los Angeles Car Lot after coming back from the Korean War. He drives the car cross country to his home in Ohio. Joe is using the car as his daily driver for some time, and has it repainted bronze / maroon metallic. 1951-53 (approx.) Joe Johnson sells the cat to John Eddington of Greenfield, Ohio. Not long after that the engine but John fixes the engine and drives the car until 1957. 1957 John Eddington parks the car at his home in Greenfield, first inside, later outside. 1972 The owner of the car takes the ’36 Ford to a local body shop for an estimate on a total repair. 1972 After the owner wants to crush the car, Don Kretzer offers to store it at his place, which he does. The car was stored in his barn, at some point the roof collapsed and the car was pushed outside. 2009 Photos of of the heavily rusted remains appear on the HAMB, people try to buy the remains but the owner declines all offers. 2010 After the owner has been in a serious car accident the car gets sold. 2016 October 22nd The car is offered For Sale again on the Custom Car Chronicle. 2016 October 29th Due to some legal issues the For Sale ad is suspended. The car is not for sale anymore. On October 22nd, 2016 I heard from the current owner Steve that the Ford was up for sale now. 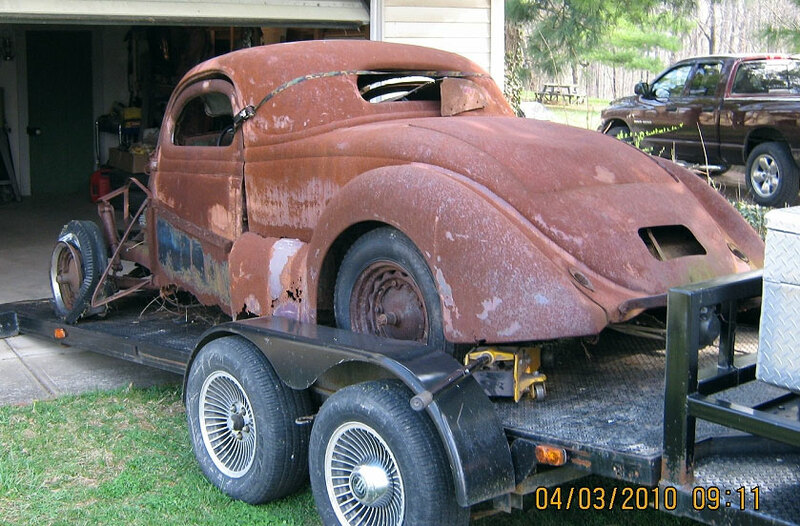 Since 2010, after he had pulled the car from the field, he had been gathering material for the restoration, a new frame, front fenders, a flathead engine and other parts and pieces. But he never really got around to get the whole project started. So it was time to look for a new owner who would be able to tackle the difficult job to bring the Bob Fairman, Jimmy Summers ’36 Ford coupe back to life again. A for Sale add was created here on the Custom Car Chronicle and several people contacted Steve about the car. On October 29th Steve asked me to pull the ad from the CCC. Apparently there where some legal issues about ownership of the cars remains, and sadly the quest to find a good new home for the car, to see a possible full restoration was stopped. The car is now once again sitting, fortunately now in much better conditions than around 2009. But it does make me sad the car is not undergoing full restoration again. I sure hope the legal matters will be solved soon, so that it will go to a new home and undergo full restoration. 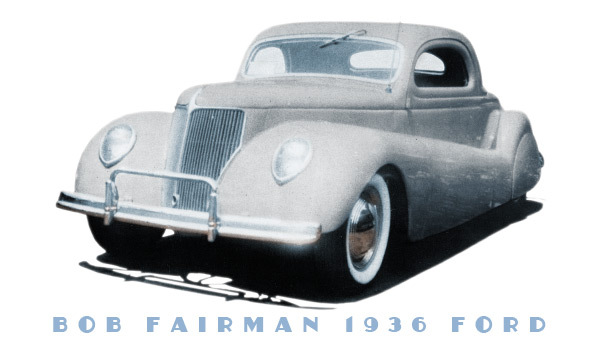 The Bob Fairman, Jimmy Summers 1936 Ford coupe with full fade-away fenders is a very important historic Custom and it deserves to be restored and enjoyed again. The Jimmy Summers Ford might not be the best ever looking custom with its bold bulbous fade-away fenders. But for sure it was trend setting and the inspiration for many others. It might be the first custom with Full fade-away fenders, as well as the first use of some sort of push button controlled doors. In October 2017we got the wonderful news that the Bob Fairman Jimmy Summers 1936 Ford Coupe has been bought by a new owner. And that the car is now being worked on to get completely restored. The new owner mentioned the car was far more complete than was thought at first. It is party in very poor condition, but very much restorable. The remain have been put together and set on a set of wheels so for the first time in many years looks again as a car. More on this wonderful news in THIS CCC-Article. Special thanks to Eddie Montgomery for sharing a lot of information and the photos from the 2009 till 2016 condition of the car. 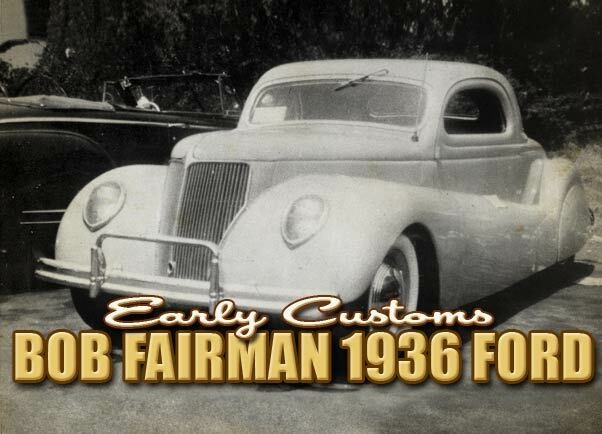 We are still looking for more information on the Jimmy Summers, Bob Fairman 1936 Ford Coupe Custom. We would love to know the original color of the car, and how long Bob owned the car before it ended up on the Cars For Sale Lot. We would love to know who had the car repainted metallic bronze, and we of course would love to see some photos of this version o the car. If you have any more information about this car, please email Rik at the Custom Car Chronicle so that we can complete the story on this Jimmy Summers Trend Setting Custom Car icon. Rik, can’t thank you enough for your sleuthing. The license plate info is invaluable, not only for this story, but for pinning down timeframes for those old photos of California cars. This car surely was a trendsetter, if not the very first we can identify with elements that later became standard fare for custom work. As to color, I’d like to offer the option of pale robins egg blue. That color was very popular in that era; I can think of several WWII era customs painted with it. Black and white photography limits us, but some colors come out darker, reds for example. Cream as you have done, is a contender for sure. It is good to know that this historic car still exists but sad to see that it’s restoration is still in limbo. I hope that the legal issues get sorted out and the car is returned to it’s former glory. As you stated Rik. Not the best looking custom ever built but surely a hint of things to come. sad to see how what bad shape this car is in. even if the legal issues ever get worked out and someone tries to restore it, you have to believe there will be very little of the original car left. Looks like he took his inspiration from the 1940 Chrysler Newport. No worries David, the car is in the right hands now, and is currently being perfectly restored. The car could not have been in better hands. Here is a link to an CCC article on how the car looked in October 2017.